Busted Carbon: Annoyed? Burn it with fire! This is one of the stranger emails I've received. 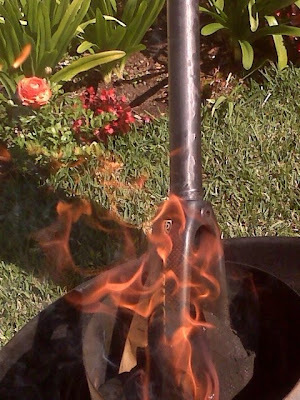 After Ritchey and Cambria both refused to warranty his fork, Wayne decided to burn it in protest. He then sent a photo of the burning fork to the customer service departments. I hope he left it on a well used cycling route. That way it can be listed such as" when you come to a burnt Ritchey fork in the road make a left". I hope he grilled a tasty steak when the coals were ready. A designer at a well-known US manufacturer told me that they reverse engineered an Italian rival's forks something like this: burning off layers of carbon in some kind of furnace/oven to work out the number and types of weaves that were used. Never buy from Cambria Bikes then. Public shaming,ha, stick it to them.